The BEST CLIMATE IN THE WORLD Yes this is pretty big statement to make, but the way our weather is changing here in the highlands makes that claim justified. Global warming is sending most of the earth to heck in a hand basket but here at least, the effects are for the better. September is normally the middle of the rainy season - actually it is closer to a monsoon season. We just had way too much rain. Now it is almost perfectly balanced. Just enough to keep the grass growing and the cows happy, but not too much to make the people miserable. 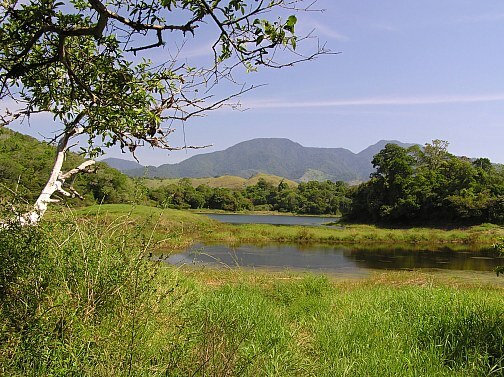 So if you are looking for Shangri-La, it might just be here in the eternal spring climate of Volcan, Panama. ELECTRICITY – THE ALTERNATIVE. By David Dell. Yes. 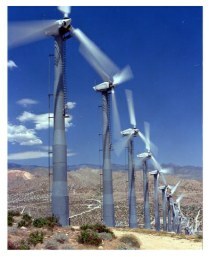 SKY Energy S.A., an affiliate of the American company SKY Engineering, is now working in Panama. Not only can they supply all of your alternative energy needs from Hydro to Solar and Biomass but for qualifying projects they can help clients obtain 15-year financing at 4% through the U.S. Export-Import bank. SKY Energy will be offering small information seminars in the Chiriqui area. 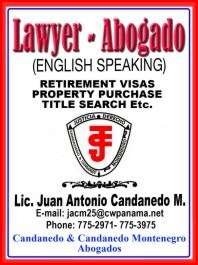 They will be held in both English and Spanish. 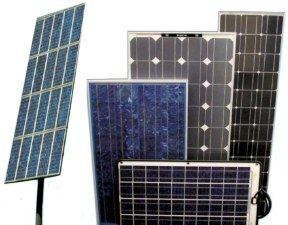 SKY Energy is also willing to offer free evaluation tests of the energy potential at you farm or country home. The highlands of Chiriqui, in Western Panama is becoming a mecca for artists from around the world. The eternal spring climate and the stark beauty of its imposing 11,400 foot high volcano, must be inspirational as artists are popping up everywhere. Brenda Paulson, is a 55-year old painter from Colorado and now calls Volcan her home. 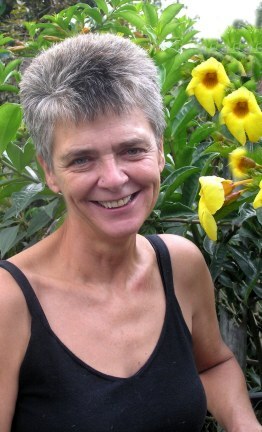 Brenda was one of the painters who made the first Chiriqui Art Festival a success. She first came to the notice of the locals when she was commissioned to paint murals on the wall of Dalys’s restaurant – the number one watering hole and café for the expats of Volcan. Last week Brenda invited me to see more of her work in her newly renovated home and art gallery in the south of Volcan. My foray into the art world has been limited and these days confined to the electronic graphics, but I think I know a thing or two about painting. Brenda works in oils, acrylics pastels and even stained glass. A brief study of her work clearly shows her depth of talent. It would be impossible to categorize Brenda as her style and media are so varied. 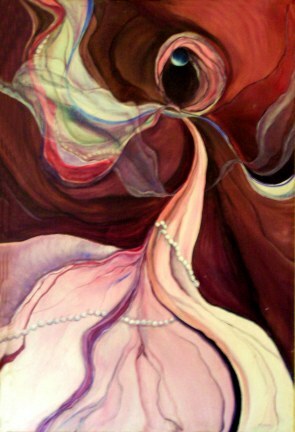 One modernistic or abstract painting which I named the “pearls” shows her ability to put deep messages into her work. Like most great artists Brenda’s life has been touched by tragedy. Despite what life has thrown at her she has more than survived. Brenda Paulson is one of the most upbeat and positive people you will meet. Recently she had a table full of patrons in hysterics as she entered Daly’s restaurant wearing a clown’s nose. 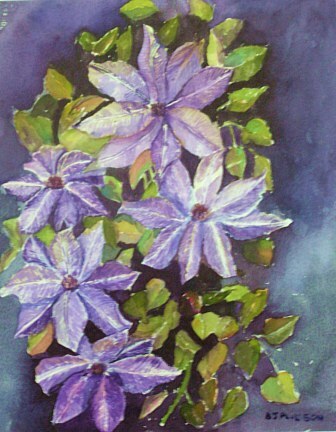 A close study of her flower paintings shows her innate ability for composition and color balance. I was particularly drawn to the detail she put into the leaves on one painting. 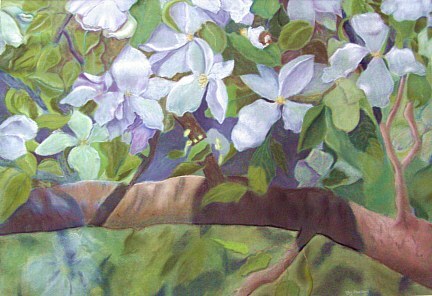 The focus of the painting would be the white flowers in the foreground but Brenda had put as much time and effort into getting the foliage just right. This is a problem with some artists; they just don’t put the time and effort into their work. This makes the difference between something that looks nice and pretty and something that keeps drawing you back to it time and again. 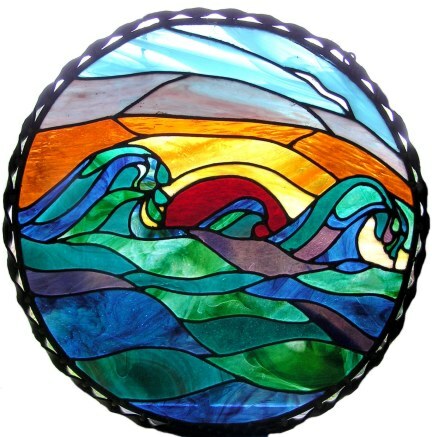 As I looked around her gallery, I spotted a circular stained glass window. The picture was of crashing waves on a stormy sea. The detail was so good, at first I thought this was a factory made piece. No, this was another example of Brenda’s wide artistic talent. Brenda has several murals on display in her native Colorado at the Teluride ski resort and at private homes in the area. She hopes to have a public display of her art sometime soon in the Volcan area. What is the secret to her creative success? Brenda explained that she paints what she likes and not what she thinks might sell. This is a reflection of her warm and genuine personality. If she could just capture her wacky sense of humor on canvas then I think she would have a real moneymaker. Repairing the road less traveled. The road from Potrerillos Ariba through the small village of El Banco has seen better times. 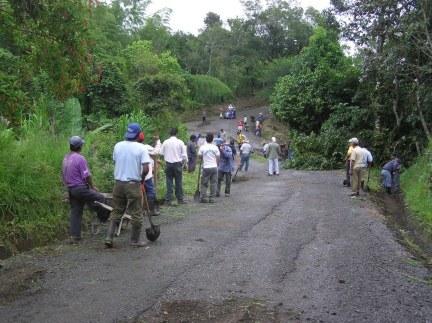 When dictator Manuel Noriega regularly traveled this road to his two mountain retreats at Escondido and the Pagoda house, the road was well maintained. Since then the asphalt has deteriorated and in parts has completely disappeared. 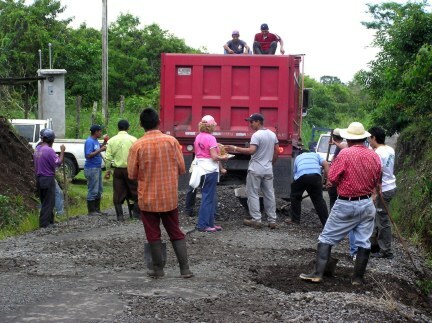 Times and governments have changed and the good citizens of El Banco have decided that it was time to fix the road themselves. Spearheading this urban renewal was the newly elected Suplente, Jaime Gonzalez and Alvaro Martinez the elected Representante, they blanketed the area with flyers asking locals to donate time to the project. Three local expat families gave $4,000 in hard cash. This paid for the 8 truckloads of gravel and a backhoe and road roller. When I arrived in El Banco on a cool overcast Sunday morning, I saw around 70 local men moving wheelbarrow loads of gravel to the thousands of small potholes. Local resident and well known author, Cindy Cody was there throughout the day providing drinks and snacks to the grateful workers. I have driven this road many times before and some of the potholes looked like moguls on a ski slope. The ruts in the mud made even a four-wheel drive vehicle slow to a crawl. I clocked the distance on my speedometer and was amazed to find that every small hole along a 5.4 kilometer stretch was filled and leveled. I talked to one local, George Pitty and asked why he felt it necessary to volunteer on his only free day of the week. George wiped the sweat from his brow and smiled as he told me it was his way of contributing to the community. As George stepped aside to allow the local bus to pass I caught a glimpse of the contented driver’s face. Here was a man that had to battle this road several times a day and maybe 6 days week. Now he could carry his passengers comfortably and at a decent speed, no doubt his embattled bus was also heaving a sigh of relief. As the men toiled on the road a group of women, led by Mary Caballero labored in kitchen of the local school preparing lunch. Outside the school on two wood fires, I noticed two large pots boiling briskly. As Napoleon so correctly deduced, an army marches on its stomach. I am sure the good ladies of El Banco created a Sancocho worth of the great general himself. Besides the food donations from the expats, the local good corporate citizen, Agricola Athena, contributed over 40 chickens to the midday meal. The El Banco road is a vital artery in this picturesque community. It is the only way for schoolchildren, businesses and people in general to go about their daily lives. The people of Panama recently decided they wanted a change in the way that their lives and country was being run. In this small village the newly elected politicians showed that they were willing to work side by side with people to make that change a reality. Just above the small mountain town of Guadalupe, along a rough road a visitor can suddenly find themselves in a true garden of delight. 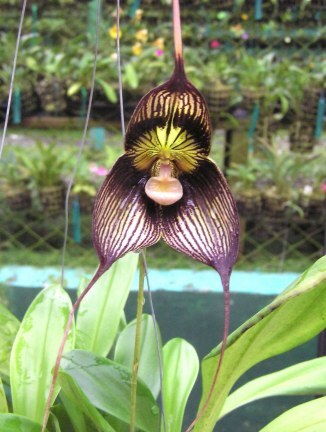 This is FINCA DRACULA – one of the world’s top ten Orchid farms. The name comes not from some ghastly gothic connection but from the name given to a species of orchids – that like their infamous counterpart – come alive at night. If you travel to Chiriqui you really should take the time to make the scenic drive from Volcan. As you pass through the towns of Cerro Punta and Guadalupe off to your left you see rock monoliths thrusting out of the ancient volcanic peaks. It appears that every available meter of land on these steep slopes is dedicated to growing fruits and vegetables. This area of Panama is the food basket of the country – supplying somewhere between 80% to 90% of all the country’s garden produce. Little wonder the climate here supports growing exotic orchids. 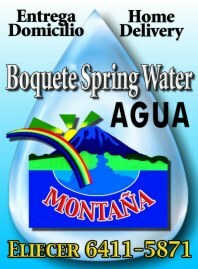 To reach Finca Dracula you drive through the town of Guadalupe and pass local landmark; Los Quetzales Lodge & Spa. Just beyond the inn take the first right turn – warning the road is rough, not suited to anything but a 4X4 vehicle. A few hundred meters more and then take the next left. There may be a sign at the junction with the name “Dracula” dripping blood (not literally). A hundred meters more over a small bridge and you enter the finca. As you drive to the office you will see a small lake to your left. A good spot to stop and take some pictures. 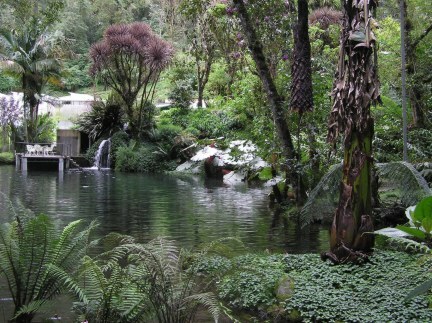 The lake is framed by tall palm trees and broad-leaved water plants, a waterfall gushes and disturbs the otherwise tranquil state of the lake. Outcroppings of bright red and orange impatiens add the essential touch of color to this placid setting. Continuing around the bend you reach the office and greenhouses. On this day my guide was 21-year old, Mizael Rodriguez. 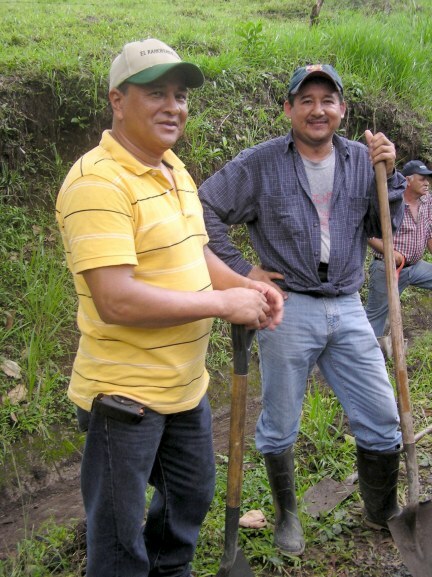 Mizael told me that his boss Andrew Maduro first started the finca as a hobby nearly forty years ago. 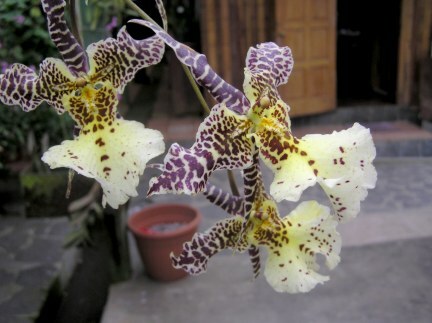 Today, this 12 hectare garden produces 2,600 types of orchid and sells them all over the world. VISITORS, can buy orchids from as little as a few dollars for the common variety to $200 for the most expensive (Cochleopa Noezliana.) Mizael said you didn’t have to come at night to see the Dracula orchids open. He gently dipped one, called Big Mamma, into a bucket of water. Sure enough, Big Mamma ominously raised her head to show her purple and yellow striped face. Finca Dracula is a great place to explore as there are small trails and walkways throughout. Several friendly dogs will be more than keen to guide you as you wander the fieldstone ringed paths. Mizael explained that orchids are grafted onto a host plant to grow. These are called epiphytes. This is different from the common variety we see on trees these are bromelias. In answer to my question Mizael confirmed that yes, bromeliads are parasites. SURPRISING HISTORY OF ESSENTIAL OILS. Since the "swine flu" seems to be a concern around the globe I thought it would be appropriate to pass on more information, actions and characteristics of essential oils. As I mentioned earlier during the 17th century plague in France there were Doctors that protected themselves and were able to work directly with victims without succumbing to this devastating disease. How you may ask? Their survival is attributed to wearing a full body suit made from leather and on their faces they wore a beak like mask that was filled with rags that had been permeated with essential oils and spices. A few that we know they used were ambergris that comes from spermwhale, cloves and cinnamon. For those of you interested, cinnamon and cloves are two spices that have been used to expel parasites. Perfumers were also immune to the plague due to the fact that they were surrounded by E.O. 's that were used in the making of their perfumes. From this was discovered the so called "4 thieves vinegar". Why call it 4 thieves? Because as lore would have it there were apparently thieves (probably 4) in Marseille during 1722 that doused themselves with a certain mixture of oils before going out to rob from the victims of the plague. That mixture included garlic, rosemary, lavender, nutmeg, sage, camphor and cinnamon. All were suspended in vinegar. Today we would use a carrier oil such as olive, hazelnut, safflower, sunflower, peanut, walnut, etc. As I mentioned earlier there are several ways to use E.O.'s. Skin absorption, by mouth or via the air passages of the lungs. The molecules of E.O. 's are small enough to pass into the hair follicles (skin) and from there into the blood stream. When we smell the oils the molecules go to the lungs and air sacs and from there into the blood stream. Below you will find a few oils along with their properties that may help to ward off the flu. Basil: Wards off flu and colds-relieves sinus problems, nausea, migraine and arthritis. Black pepper: used for malaria and cholera-stimulates circulation-soothes stomach cramps, heartburn and nausea. Cedarwood: treats respiratory problems, coughs, colds and flu-expels mucus from lungs-has antiseptic properties. Cinnamon: antimicrobial and treats infectious illness. Clove: antibiotic-antiseptic and antiviral properties. Eucalyptus: antiseptic, antiviral and expectorant properties. Garlic: antibiotic, antiseptic, antiviral and antibacterial actions. Ginger: used for arthritis, muscle aches, coughs, sore throats and flu nausea. Lavender: used as an analgesic, antimicrobial and antiseptic. Lemon: antimicrobial, anti rheumatism, antiseptic and bactericidal. Orange: antiseptic and bactericidal. Peppermint: bruises, sprains, anti inflammatory, antimicrobial, antiseptic, antiviral, and an expectorant. Tea tree: antiseptic, anti inflammatory, antibiotic and antiviral actions. Thyme oil: antimicrobial, anti oxidant, anti rheumatic, antiseptic and an expectorant. Two to four oils work best together. Whereas one oil has all the mentioned properties you see above and will work at warding off viruses, etc. it is thought that 2-4 oils work synergistically together and gives one more opportunity to stay clear of illness.